Background: This study sought to evaluate the effect of basic fibroblast growth factor eye drops and cysteine oral supplements on corneal healing in patients treated with photorefractive keratectomy (PRK). Materials and Methods: One hundred and twenty patients treated bilaterally with PRK for myopia were enrolled at one of two eye centers (Clinica Santa Lucia, Bologna, Italy and Department of Ophthalmology, University of Magna Graecia, Catanzaro, Italy) and were treated at the former center. Sixty patients included in the study group (Group 1) were treated postoperatively with topical basic fibroblast growth factor plus oral L-cysteine supplements, whereas 60 subjects included in the control group (Group 2) received basic fibroblast growth factor eye drops. We recorded the rate of corneal re-epithelialization and patients were followed-up every 30 days for 6 months. Statistical analyses were performed on the collected data. Results: The eyes in Group 1 demonstrated complete re-epithelialization at Day 5, whereas the eyes in Group 2 achieved this status on Day 6. No side-effects were reported. Conclusions : Patients treated with basic fibroblast growth factor eye drops and L-cysteine oral supplements benefit from more rapid corneal re-epithelialization. In human eyes, this combination treatment appeared to be safe and effective in accelerating corneal surfacing after surgery. Financial Disclosure: No author has any financial or proprietary interest in any material or method used in this study. Trial Registration: Current Controlled Trials ISRCTN73824458. Furthermore, several components of the tear film, such as inflammatory cells, molecules from the extracellular matrix, corneal epithelial cells and corneal stromal fibroblasts, are able to modify the complex biological process of corneal wound healing, and previous studies have demonstrated how growth factors affect corneal wound healing after PRK. ,,,,,,,, Visual rehabilitation after PRK depends on epithelial repopulation and stromal healing without fibrosis, and it was recently reported that the topical application of neurotrophic substances, such as growth factors, can promote corneal wound healing (references). We recently demonstrated that the topical application of basic fibroblast growth factor (b-FGF) is safe and effective in promoting epithelial and stromal healing after PRK; specifically, b-FGF promotes the proliferation of epithelial and stromal cells and affects the remodeling of the ECM. , This growth factor has also been shown to be expressed in almost all tissues of mesodermal and neuroectodermal origin. Furthermore, the levels of endogenous b-FGF have been shown to increase at sites of injury, suggesting that its release and activation from intracellular and extracellular sources may be an integral part of the wound healing process. ,,,, Initially, the effect of b-FGF on corneal wound healing was investigated both in rabbits and in transgenic mice, and these studies reported significant improvement in epithelial healing after PRK. ,,,, In the present study, we investigated the efficacy of b-FGF eye drops combined with L-cysteine oral supplementation for the treatment of corneal epithelial healing after PRK in myopic patients. As 1 week may be required to recover an intact epithelium and several weeks before best-corrected visual acuity (BCVA) is achieved, we tested whether this pharmacological combination could expedite epithelial healing and improve pain after PRK. One hundred and twenty patients (240 eyes), who were between the ages of 30 and 45 years (mean age = 37.3 ± SD 2.3 years) and were treated bilaterally with PRK for myopia (mean = −4.5 ± SD 1.5 D) were enrolled in this prospective randomized study. This study was conducted according to the procedures of the Declaration of Helsinki. All subjects provided written informed consent after the nature of the procedures had been explained in detail. We enrolled patients using the following inclusion criteria: Mean spherical equivalent (SE) within the range − 3 and − 6 D, BCVA equal to or greater than 20/25 and corneal central thickness (CCT) within the range of 540 microns and 550 microns. All subjects with ocular disease (which could cause a deficit in visual functionality), diabetic retinopathy, glaucoma, diseases affecting the anterior segment, macular degeneration, either vitreous or retinal disorders, retinal vasculopathies, anterior and/or posterior uveitis and systemic disorders (which could affect the ocular system and modify the corneal healing process) were excluded from this study. , We also excluded patients with any evidence of lid disease, progressive or unstable myopia and keratoconus, a history of herpetic keratitis and previous intraocular and/or corneal surgery. All subjects included in the study were randomized into two treatment groups (Group 1 and Group 2). Sixty patients were included in the study group (Group 1) and were treated postoperatively with standard topical antibiotics, corticosteroids, artificial tear therapy and topical b-FGF eye drops plus oral L-cysteine supplements. In addition, 60 subjects were included in the control group (Group 2) and received standard topical antibiotics, corticosteroids and artificial tears as postoperative therapy plus b-FGF eye drops only. All patients enrolled were evaluated the day prior to surgery (visit 0) and received a complete ophthalmological examination, including BCVA, biomicroscopy, tonometry (Altair ultrasonic pachymeter; Optikon 2000, Rome, Italy), corneal endothelial cell count (Cellcheck XL; Konan Medical Inc, Irvine, CA USA), topography (CSO CM02/CM-P02, CSO, Florence, Italy) and funduscopy evaluation. All patients received corneal pachymetry to measure the central corneal thickness and corneal topography to map the curvature of the corneal surface. Tear function was assessed using Shirmer's test without corneal anesthesia, and we also determined the tear film breakup time (BUT). Soft contact lens wearers were invited to discontinue use for a minimum of 3 days prior to surgery, while rigid gas-permeable contact lens wearers were required to suspend use for a minimum of 3 weeks prior to the ophthalmological examination performed the day before surgery. A single operator carried out the refractive procedure. PRK was performed using a Schwind Esiris excimer laser (Schwind GmbH, Germany) with an emission wavelength of 193 nm. This excimer laser uses a 0.8 mm flying spot, a Gaussian bean with a repetition rate of 250 Hz and a 250 Hz infrared eye tracker, which monitors the pupil margin and centers the ablation on the entrance pupil center. All surgical procedures took place between 9 am and 1 pm Preoperatively, patients were treated with oxibuprocaina hydrochloride 0.4% (Novesina 0.6 mL 0.4%, Novartis Farma Spa, Italy) and the eye lashes and lids were treated with a povidone-iodine swab. The surgeon marked a 9.0-mm zone with an approved dye, centering it over the image of the pupil. Ethyl alcohol (90%) diluted in physiological saline solution (20%) was used to remove the central 9 mm of the corneal epithelium. This was followed by laser photoablation of both the Bowman's layer and the anterior corneal stroma. After PRK, a contact lens was applied and all patients received the standard topical medication recommended by the current guidelines, consisting of topical tobramycin (Tobral 0.3%; Alcon, TX, USA) and diclofenac eye drops (Voltaren-ofta 0.1%; Novartis, Italy) every 6 h for the first week, followed by twice a day for 1 month. Artificial tears were applied every hour until corneal epithelial healing was completed (Hyaluronate 0.2%; Hyalistil, Sifi, Italy). Subjects included in Group 1 also received topical medication with b-FGF at dose of 10 μg per 10 μL (recombinant b-FGF, Prodotti Gianni, Italy) four times a day (every 6 h) for 7 days beginning on the day of surgery. These patients were also treated with oral L-cysteine supplements (L-Cysteine; Natural Point S.r.l., Italy) at dose of 500 mg once a day for a period of 15 days beginning 7 days prior to PRK. Patients in Group 2 were treated with b-FGF eye drops only. Beginning on the day after surgery, all subjects were evaluated daily until corneal healing appeared complete by biomicroscopy and corneal central thickness was increased according to pachimetry. We also recorded the rate of corneal re-epithelialization using daily slit-lamp evaluation. The follow-up period lasted 6 months, during which time all patients underwent complete ophthalmological examinations every 30 days, including BCVA, slit-lamp biomicroscopic observation, applanation tonometry, pachimetry and retina examination. During the follow-up visits, the physician also observed the haze levels. All data were subjected to statistical analysis. We performed the Student's t test for unpaired samples to evaluate differences in means between the two treatment groups. We also calculated the P value to define the statistical significance of the results, with P ≤ 0.05 considered statistically significant. All statistical calculations were performed using the MedCalc 11.4.1.0 software. There were no significant differences in preoperative variables between the two groups and the variables followed a Gaussian distribution. However, the re-epithelialization rates differed between Group 1 and Group 2. Complete corneal epithelial resurfacing was achieved starting at Day 3 after PRK in 57% of the eyes included in the study group (Group 1) and in 44% of the eyes in the control group (Group 2). At Day four, 99% of the eyes included in Group 1 showed complete healing, while just 89% of the eyes in Group 2 achieved the same result. Furthermore, we observed complete re-epithelialization in all patients treated with topical b-FGF eye drops plus oral L-cysteine supplementation at Day 5, while the patients in Group 2, who were treated with topical b-FGF only, did not achieve complete resurfacing until Day 6 or Day 7 after the surgical procedure. Moreover, subjects treated with b-FGF plus L-cysteine demonstrated a re-epithelialization time of 3.3 days ± SD 0.3, whereas patients treated with b-FGF only required a longer time to achieve a complete re-epithelialization (4.8 days ± SD 0.5). 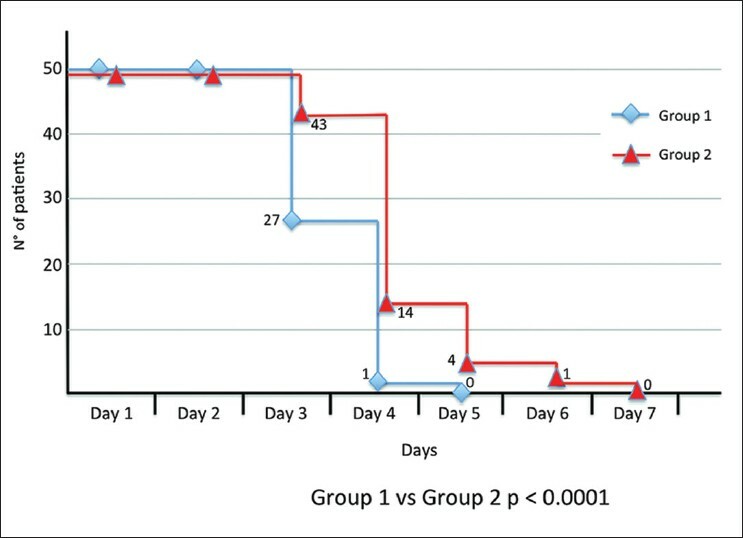 The Kaplan-Meier curves also demonstrated a statistically significant difference between the two groups (P < 0.0001) from Day 3 to Day 5 postsurgery [Figure 1]. No statistically significant differences were observed regarding haze prevalence or BCVA after PRK between Group 1 and Group 2. All subjects treated in both groups showed a BCVA that ranged from 20/25 to 20/20, and no loss of lines of the BCVA was detected in either group. No side-effects related to the treatments were reported during the study and none of the subjects were lost to follow-up during the 6-month follow-up period. Trace to mild corneal haze was observed in both groups, including in four eyes of the study group and six eyes of the control group, and statistical analysis did not show any significant differences between the two groups. Growth factors are also known to play a primary role both in corneal wound healing and in remodeling of the ECM. In this study, we found that patients treated with both b-FGF eye drops and L-cysteine oral supplements benefited from more rapid corneal re-epithelialization, which indicates that these two compounds, which act at different subcellular sites, may deliver synergistic effects when used in combination. Moreover, this combination appeared to be safe on human eyes and more effective than topical b-FGF treatment alone. However, no significant differences in corneal haze formation or BCVA were noted between the two groups. Further studies are needed to test this innovative treatment in patients with an expected delay in corneal epithelium healing and to expand the treatment's potential application to other corneal pathological diseases. Imanishi J, Kamiyama K, Iguchi I, Kita M, Sotozono C, Kinoshita S. Growth factors: importance in wound healing and maintenance of transparency of the cornea. Prog Retin Eye Res 2000;19:113-29. Netto MV, Mohan RR, Ambrósio R Jr, Hutcheon AE, Zieske JD, Wilson SE. Wound healing in the cornea-a review of refractive surgery complications and new prospects for therapy. Cornea 2005;24:509-22. Siganos DS, Katsanevaki VJ, Pallikaris IG. Correlation of subepithelial haze and refractive regression 1 month after photorefractive keratectomy for myopia. J Refract Surg 1999;15:338-42. Bilgihan K, Bilgihan A, Adiguzel U, Sezer C, Yis O, Akyol G, et al. Keratocyte apoptosis and corneal antioxidant enzyme activities after refractive surgery. Eye 2002;16:63-8. Brancato R, Schiavone N, Siano S, Lapucci A, Papucci L, Donnini M, et al. Prevention of corneal keratocyte apoptosis after argon fluoride excimer laser irradiation with the free radical scavenger ubiquinone Q10. Eur J Ophthalmol 2000;10:32-8.
de Medeiros FW, Mohan RR, Suto C, Sinhá S, Bonilha VL, Chaurasia SS, et al. Haze development after photorefractive keratectomy: mechanical vs ethanol epithelial removal in rabbits. J Refract Surg 2008;24:923-7. Faktorovich EG, Badawi DY, Maloney RK, Ariyasu RG. Growth factor expression in corneal wound healing after excimer laser keratectomy. Cornea 1999;18:580-8. Baldwin HC, Marshall J. Growth factors in corneal wound healing following refractive surgery: A review. Acta Ophthalmol Scand 2002;80:238-47. Wilson SE, Mohan RR, Mohan RR, Ambrósio R Jr, Hong J, Lee J. The corneal wound healing response: Cytokine-mediated interaction of the epithelium, stroma, and inflammatory cells. Prog Retin Eye Res 2001;20:625-37. Klenkler B, Sheardown H. Growth factors in the anterior segment: Role in tissue maintenance wound healing and ocular pathology. Exp Eye Res 2004;79:677-88. Tervo T, Virtanen T, Honkanen N, Härkönen M, Tarkkanen A. Tear fluid plasmin activity after excimer laser photorefractive keratectomy. Invest Ophthalmol Vis Sci 1994;35:3045-50. Kuo IC. Corneal wound healing. Curr Opin Ophthalmol 2004;15:311-5. Fagerholm P. Wound healing after photorefractive keratectomy. J Cataract Refract Surg 2000;26:432-47. Suzuki K, Saito J, Yanai R, Yamada N, Chikama T, Seki K, et al. Cell-matrix and cell-cell interactions during corneal epithelial wound healing. Prog Retin Eye Res 2003;22:113-33. Schultz GS, Davis JB, Eiferman RA. Growth factors and corneal epithelium. Cornea 1988;7:96-101. Wilson SE, Schultz GS, Chegini N, Weng J, He YG. Epidermal growth factor, transforming growth factor alpha, transforming growth factor beta, acidic fibroblast growth factor, basic fibroblast growth factor, and intrerleukin-1 proteins in the cornea. Exp Eye Res 1994;59:63-71. Wilson SE, He YG, Lloyd SA. EGF, basic EGF receptor, basic FGF, TGF beta-1 and IL-1alpha mRNA in human corneal epithelial cells and stromal fibroblasts. Invest Ophthalmol Vis Sci 1992;33:1756-65. Fini ME, Girard MT, Matsubara M. Collegenolytic/gelatinolytic enzymes in corneal wound healing. Acta Ophthalmol Suppl 1992; 202:26-33. Li DQ, Shang TY, Kim HS, Solomon A, Lokeshwar BL, Pflugfelder SC. Regulated expression of collagenases MMP-1,-8 and -13 and stromelysins MMP-3,-10 and -11 by human corneal epithelial cells. Invest Ophthalmol Vis Sci 2003;44:2928-36. Holopainen JM, Moilanen JA, Sorsa T, Kivelä-Rajamäki M, Tervahartiala T, Vesaluoma MH, et al. Activation of matrix metalloproteinases-8 by membrane type 1-MMP and their expression in human tears after photorefractive keratectomy. Invest Ophthalmol Vis Sci 2003;44:2550-6. Henriet P, Blavier L, Declerck YA. Tissue inhibitors of metalloproteinases (TIMP) in invasion and proliferation. APMIS 1999;107:111-9. Fini ME. Keratocyte and fibroblast phenotypes in the repairing cornea. Prog Retin Eye Res 1999;18:529-51. Thill M, Schlagner K, Altenähr S, Ergün S, Faragher RG, Kilic N, et al. A novel population of repair cells identified in the stroma of the human cornea. Stem Cells Dev 2007;16:733-45. Yamagami S, Yokoo S, Mimura T, Takato T, Araie M, Amano S. Distribution of precursors in human corneal stromal cells and endothelial cells. Ophthalmology 2007;114:433-9. Gospodarowicz D, Neufeld G, Schweigerer L. FGF structural and biological properties. J Cell Physiol Suppl 1987;5:15-26. Zhu X, Komiya H, Chirino A, Faham S, Fox GM, Arakawa T, et al. Three-dimensional structure of acidic and basic fibroblast growth factors. Science 1991;251:90-3. Partanen J, Vainikka S, Korhonen J, Armstrong E, Alitalo K. Diverse receptors of fibroblast growth factors. Prog Growth Factor Res 1992;4:69-83. Faktorovich EG, Steinberg RH, Yasumura D, Matthes MT, LaVail MM. Basic fibroblast growth factor and local injury protect photoreceptors from light damage in the rat. J Neurosci 1992;12:3554-67. Logan A, Frautschy SA, Gonzalez AM, Baird A. A time course for the focal elevation of synthesis of basic fibroblast growth factor and one of its high-affinity receptors (flg) following a localized cortical brain injury. J Neurosci 1992;12:3828-37. Assouline M, Hutchinson C, Morton K, Mascarelli F, Jeanny JC, Fayein N, et al. In vivo binding of topical bFGF on rabbit corneal wound. Growth factors 1989;1:251-61. David T, Rieck P, Renard G, Hartmann C, Courtois Y, Pouliquen Y. Corneal wound healing modulation using basic fibroblast growth factor after excimer laser photorefractive keratectomy. Cornea 1995;14:227-34. Rieck P, David T, Hartmann C, Renard G, Courtois Y, Pouliquen Y. Basic fibroblast growth factor modulates corneal wound healing after excimer laser keratomileusis in rabbits. Ger J Ophthalmol 1994;3:105-11. Rieck P, Assouline M, Savoldelli M, Hartmann C, Jacob C, Pouliquen Y, et al. Recombinant human basic fibroblast growth factor (Rh-bFGF) in three different wound models in rabbits: Corneal wound healing effect and pharmacology. Exp Eye Res 1992;54:987-98. Meduri A, Scalinci SZ, Morara M, Ceruti P, Grenga PL, Zigiotti GL, et al. Effect of basic fibroblast growth factor in transgenic mice: Corneal epithelial healing process after excimer laser photoablation. Ophthalmologica 2009;223:139-44. Cua IY, Pepose JS. Late corneal scarring after photorefractive keratectomy concurrent with development of systemic lupus erythematosus. J Refract Surg 2002;18:750-2. Carp GI, Verhamme T, Gobbe M, Ayliffe WH, Reinstein DZ. Surgically induced corneal necrotizing keratitis following LASIK in a patient with inflammatory bowel disease. J Cataract Refract Surg 2010;36:1786-9. Shimmura S, Masumizu T, Nakai Y, Urayama K, Shimazaki J, Bissen-Miyajima H, et al. Excimer laser-induced hydroxy radical formation and keratocyte death in vitro. Invest Ophthalmol Vis Sci 1999;40:1245-9. Hayashi S, Ishimoto S, Wu GS, Wee WR, Rao NA, McDonnell PJ. Oxygen free radical damage in the cornea after excimer laser therapy. Br J Ophthalmol 1997;81:141-4. Kasetsuwan N, Wu FM, Hsieh F, Sanchez D, McDonnell PJ. Effect of topical ascorbic acid on free radical tissue damage and inflammatory cell influx in the cornea after excimer laser corneal surgery. Arch Ophthalmol 1999;117:649-52. Kourenkov VV, Mytiagina ON, Kasparov AA, Pavluk AG. Stimulating re-epithelialization after photorefractive keratectomy. J Refract Surg 1999;15:S234-7. Bilgihan K, Ozdek S, Ozoðul C, Gurelik G, Bilgihan A, Hasanreisoðlu B. Topical vitamin E and hydrocortisone acetate treatment after photorefractive keratectomy. Eye (Lond) 2000;14:231-7. Vinciguerra P, Camesasca FI, Ponzin D. Use of aminoacids in refractive surgery. J Refract Surg 2002;18:S374-7. Meduri A, Grenga PL, Scorolli L, Ceruti P, Ferreri G. Role of cysteine in corneal wound healing after photorefractive keratectomy. Ophthalmic Res 2009;41:76-82. Scorolli L, Meduri A, Morara M, Scalinci SZ, Greco P, Meduri RA, et al. Effect of cysteine in transgenic mice on healing of corneal epithelium after excimer laser photoablation. Ophthalmologica 2008;222:380-5. Meduri A, Aragona P, Grenga PL, Roszkowska AM. Effect of Basic Fibroblast Growth Factor on Corneal Epithelial Healing After Photorefractive Keratectomy. J Refract Surg 2012;28:220-3. Scalinci SZ, Scorolli L, Meduri A, Grenga PL, Corradetti G, Metrangolo C. Effect of basic fibroblast growth factor and cytochrome c peroxidase combination in transgenic mice corneal epithelial healing process after excimer laser photoablation. Clin Ophthalmol 2011;5:215-21.